PLAINFIELD, IL--(Marketwired - September 05, 2017) - uBreakiFix opened in Plainfield on September 1 at 13511 S. Route 59. The fast-growing technology repair brand provides same-day repair service of all electronics, specializing in cell phone repair and computer repair at its more than 325 locations across North America. uBreakiFix Plainfield joins nearby locations in Naperville and Montgomery, and 14 additional brand locations across the state. This is the first location for owners Ivan and Samantha Valle, who were drawn to the company for its vision and values, which align closely with their own. Ivan Valle joins uBreakiFix after nearly a decade's work for Costco Wholesale and is excited for the opportunity to apply those skills and tools in his latest venture. "I've always been fascinated by learning what makes things tick. Even from a young age, I was often taking devices apart and putting them back together," said Ivan Valle. "I'm excited to channel that passion into a career in tech repair and look forward to serving the community with high quality parts and friendly customer service at an affordable price. We hope to be the go-to resource to meet all of the Plainfield community's tech repair needs." uBreakiFix services all brands of electronics, offering phone screen repair, computer repair and more to consumers and businesses alike. To date, the company has completed more than 3 million repairs, including cracked screens, water damage, software issues, camera issues and most other technical problems. uBreakiFix has more than 325 locations open across the U.S. and Canada, with nearly 700 in development. uBreakiFix is known for its timely service, focus on providing an exceptional customer experience and its ability to fix anything and everything with a power button. Each repair comes with a 90-day warranty and a price match guarantee. "Our commitment to our customers is what drives our continual growth, innovation and improvement," said Wetherill, uBreakiFix CEO and founder. "We're always looking for ways to better serve the communities we call home. We're excited for the opportunity to bring reliable repair service and exceptional customer service to Plainfield and the surrounding areas." 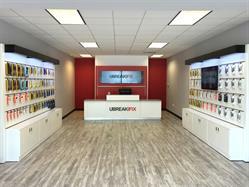 uBreakiFix Plainfield is located at 13511 S. Route 59, Ste. 107, Plainfield IL, 60544 and can be reached at: 815-782-8284. For more information and to view a service menu, visit ubreakifix.com. uBreakiFix specializes in same-day repair service of small electronics, repairing cracked screens, water damage, software issues, camera issues and other technical problems at its more than 325 stores across North America.